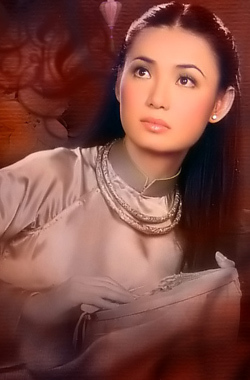 Loan Châu is considered one of the top Vietnamese Oversea singers up-to-date. She was first discovered in 1996 by musical director Truc Ho at Asia Production. Her real name is Ninh The Loan Chau, however she combined her parents' first names (Cat, from her father and Loan, from her mother) to come up with the stage name Ninh Cat Loan Chau. Loan Chau came to the United States in 1991, and reunited with her family in Westminster California. Loan Chau is the only musically inclined person in her family. As she recalled, her first experience in front of an audience was around the age of six where she sang in front of her classmates. At the age of 8, Loan Chau began writing children songs to perform for her friends. Due to this unusual gift, the teachers in her school took notice and allowed her to be part of a group of children in the entertainment committee. Her other musical activities involved being a part of her church's choir since a very early age. Loan Chau fondly talks about this period as one of the most memorable part of her childhood. In 1995, four years after arriving in California, Loan Chau won top honors at a karaoke contest at Ritz night club in Orange County. In 1996, after a meeting with Truc Ho, Loan Chau signed an exclusive contract with the Asia and became one of the organization's many bright young stars. In April 1997, Loan Chau sang in her first gig in Virginia where she was paid for the first time for her singing. In 2000, Loan Chau established her own music label called "Loan Chau Music" and also signed on to sing exclusively for Thuy Nga Production. In 2007, after 10 years in the music industry, Loan Chau's dream finally came true when she official produced and distributed products under her own label "Loan Chau Music".